With their round displacement bottoms, or “hulls”, and smaller, fuel-efficient engines, trawlers take the leisurely route, often cruising at only 10-15 mph en route to their destination. That’s okay, because the average trawler owner isn’t in a hurry. Rather, they know that half the fun is in the journey. Trawlers boast an abundance of space, from the spacious salon on the main deck to multiple staterooms below. An open aft deck allows passengers to get out from under cover and enjoy the sunshine. 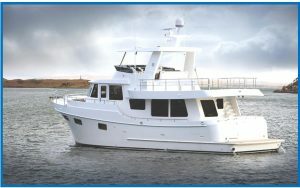 Below, sleeping accommodations, a head (toilet and shower), and galley (kitchen) offer all the conveniences of home.Long-distance cruising at a leisurely pace is a trawler’s specialty, making these boats a favorite for environments like the intracoastal waterway. A trawler’s lower-horsepower engines also consume less fuel, giving them exceptional range. With their spacious interiors, however, trawlers also make for a great weekend escape…even if they never leave the dock. Desire a little more power? Semi-displacement hull models are also available, and can travel at speeds up to 35 mph. Inboard engines, often in pairs, are housed within an aft engine room. Driveshafts pass through the hull and attach to a fixed propeller. Steering is accomplished via a movable rudder, located farther back, or “aft”, of the propeller blades. Below 40’, both gasoline and diesel options are typically available. Above that length, diesels rule due to their greater torque and fuel economy.